This was the meal I made for Valentine’s day and it was perfection if I do say so myself. This steak was amazing and quite possibly the best steak I’ve ever had. This is also the perfect thing to make when it’s too cold out to grill. Although after having steak this way, I’m not sure I’d ever grill steak again. Searing the steak and then baking it creates the most moist, flavorful and tender steak. You’ve got to give this a try, it’s the perfect dish for a romantic evening in. It’s definitely a stunning dish and is absolutely restaurant quality. In a small bowl, whisk together 1/2 the butter with garlic, rosemary, and lemon zest. Form mixed butter into a log and place in plastic wrap, refrigerate. Meanwhile, generously season your steaks with salt and pepper (don’t be shy). Preheat the oven to 400°F. Heat olive oil and remaining butter in an oven-proof skillet on high. 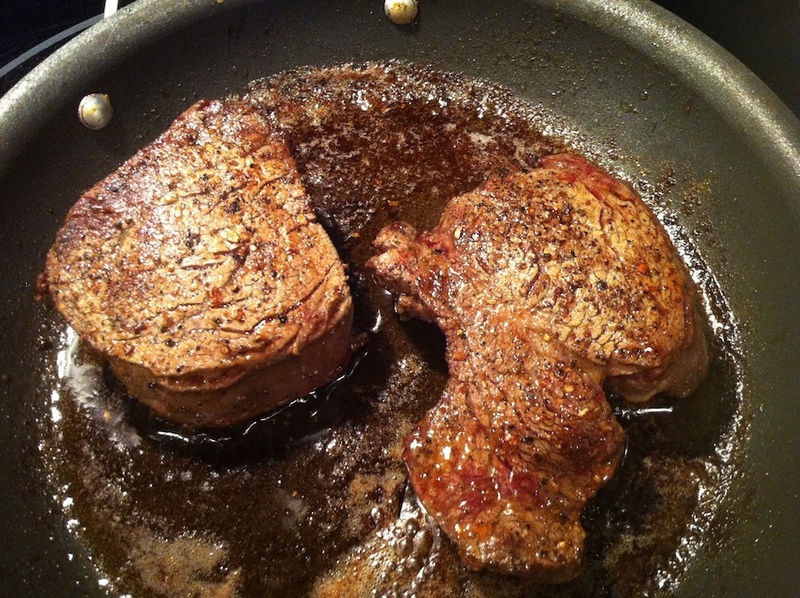 Once the pan is very hot, sear the steaks for about 2-3 minutes on each side until nice and brown. 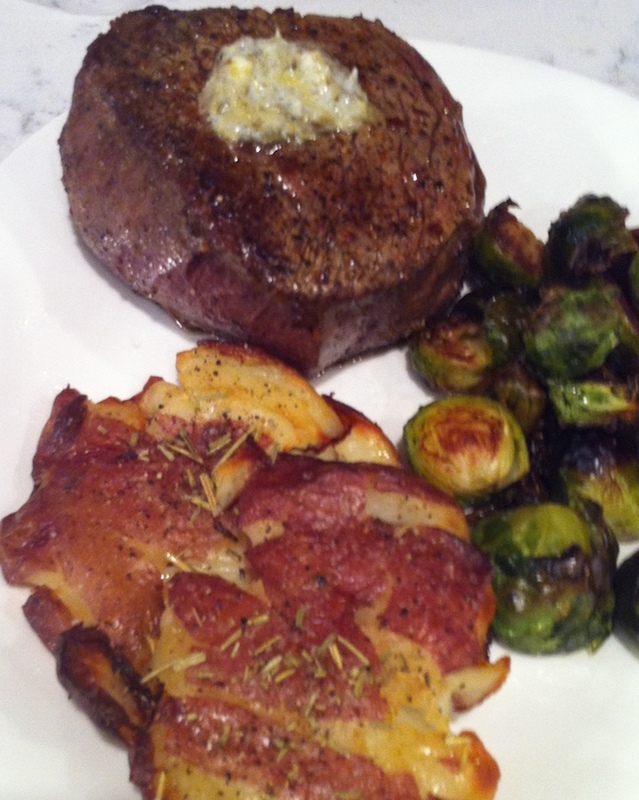 While the steak is searing, spoon melted butter over the steaks while they cook. Place the steaks in the oven to finish cooking, about 6-8 minutes for medium-rare (depending on the thickness of your steaks–7 minutes was perfect for me with a really medium-rare). As soon as the steak comes out of the oven, top with some of the prepared butter. Having personally had this meal, I can state that this is by far the best meal I’ve ever had in my life… ever! Wow! Best meal ever?! High praise indeed! we are having it again for a third time tomorrow- only I’m cooking it :-). And you did an excellent job!